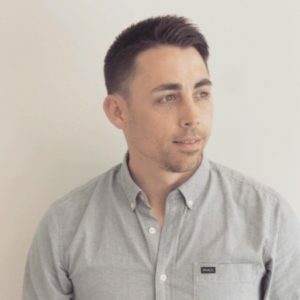 Here is how Charles Drengberg built a simple client communication hub in WordPress that allows clients to check the status of their marketing at any time. The quality of the relationship between client and agency dictates the quality of work, the opportunity to succeed, and the overall cultures of both companies. Here at Big Presence, we’re often asked to help understaffed corporate marketing departments launch into digital marketing for the first time. Or, in other cases, we must completely revamp the way that a business markets themselves online. With these kinds of sweeping changes, process development and ease-of-use solutions are critical for building trust early in the relationship with the new client. Clients can often struggle to keep up with the increased pace of work coming from our team. As they adjust to our new campaigns, they must also manage the lofty expectations of their company leadership, who may not have much experience with digital marketing. They often do all of this while keeping up with their existing marketing responsibilities inside of the organization, such as event marketing, trade shows, print marketing and advertising. What is the current status of our work in progress with Big Presence (BP)? How can we maintain visibility into work in progress and learn from BP along the way? How can we better manage our monthly retainer hours with Big Presence and know what we have available to us from week to week? How is Big Presence adding value to our business from day-to-day? 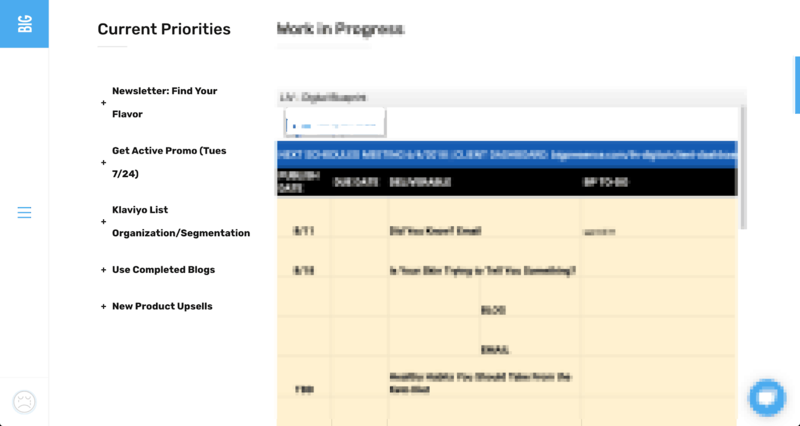 What aspects of our marketing should be prioritized from week to week? Depending on the client, and what’s going on in their business at any given time, these questions can eat into every meeting, slow down progress on campaigns and cause rifts between our teams when a client is unclear on the details of our combined work efforts. From the beginning, Big Presence committed to implementing software and processes that tear down the wall between agency and client and demystified the costs and values associated with hiring us as the Agency of Record. In an effort to improve communication and streamline task delegation to the Big Presence team members, we first built an online process for managing website design/development projects that allows BP to manage clients all over the world. It gives the client the same personal attention as a weekly face-to-face meeting. Here’s a look at the technology stack we use to make website projects +30% faster than previous processes. UXpin is used to prototype digital design projects and provide clients with an easy interface for giving feedback on work by annotating right on top of a web-based mockup. TrackDuck is used to gather client feedback on sites in development from a real-world view of the website or landing page. Both of these tools feed into Teamwork Projects, which automatically turns feedback into tasks for designers and developers at BP. That’s a great process for a specific type of project we do for our clients, but managing ongoing work between two separate teams and reporting on the success of that work on a regular basis presents a whole host of other challenges. That’s a lot of different screens for a client who hired Big Presence to make their working lives easier. Their goal is to provide on-the-spot answers to tough questions that senior leadership and a Board of Directors can ask of their sales and marketing departments on a whim. Although all of these solutions usually create a better holistic experience than the client’s previous marketing tech stack… it still wasn’t simple enough for us. The business impact that our agency provides and how we do it. 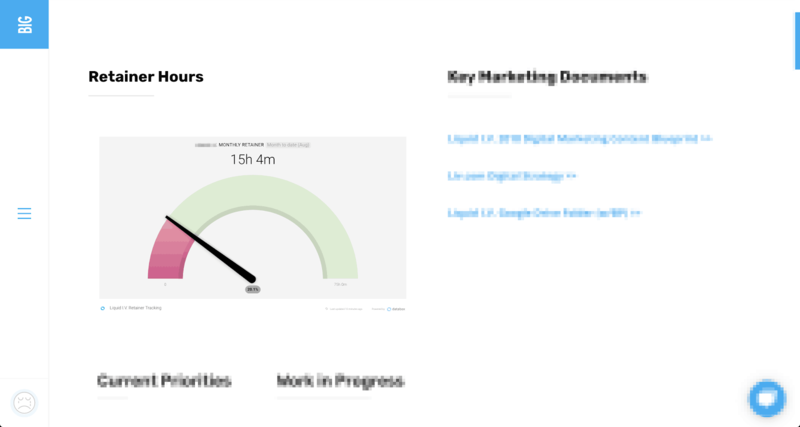 We have created a password-protected client dashboard hosted on BigPresence.com that allows clients to log into one page to view everything from the agency relationship to reporting that validates we’re all moving the numbers forward where needed. We pull real-time retainer hours from Teamwork Projects and display it using a Databox Databoard with a gauge. It shows completed and remaining hours in the month’s retainer in the way that your fuel tank is displayed on the dashboard in your car. Here’s a video of how to set up the Datablock. And here’s how to display this Databoard in your client dashboard if it is managed on WordPress. We maintain a single repository for all of the key Google Docs being used to manage a client’s strategy, works-in-progress, and shared information for easy access during stand-up meetings or when a client is searching for something we’re collaborating on. One of the keys to maintaining a good relationship with our clients is never losing sight of the short-term and long-term goals of Senior Leadership at the client. From time to time, a client’s marketing team can lose sight of the bigger picture for the company, and that can cause drift between stakeholder-involved meetings. We’ve made a point to gather the key priorities of decision-makers for our clients and keep them updated on the client dashboard where everyone can see them. This brings peace of mind to those only checking in occasionally at the top of the organization and keeps our teams focused on what we were tasked to accomplish in the first place. Clients are not enthusiastic about utilizing our agency’s project management software. So, we’ve always used Google Sheets to create an easy-to-use environment where tasks are displayed alongside responsibilities for both teams and the links to the work in process for easy visibility into their status. We also manage all communications on these tasks using the commenting features of Google Sheets, which means clients receive email updates that link directly to the blueprint, and it’s nearly impossible to lose track of a task. We’re now embedding these Google Docs on client dashboards so that we can run weekly stand-up meetings with clients from the dashboard and review/discuss deliverables on the same page alongside the reporting data. With the client relationship and communications on deliverables managed at the top of the Client Dashboard, the rest of the dashboard will consist of reporting databoards from Databox embedded on the page. Each report is customized to the client’s need and can bring in data from every piece of sales and marketing software that drives our efforts. 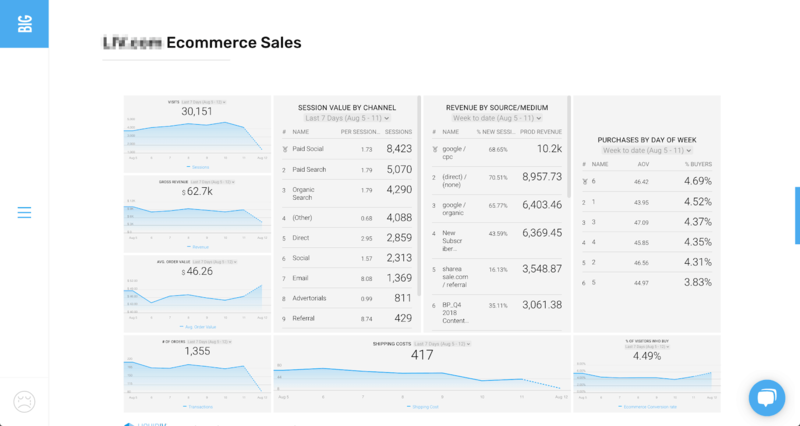 Databox allows us to customize these reports for every level of concern within the client’s business, meaning executives get a view of only what they care about, marketers and salespeople get granular views into their success and Big Presence can quickly identify the areas in need of more attention from week-to-week for us to hit the required KPIs. 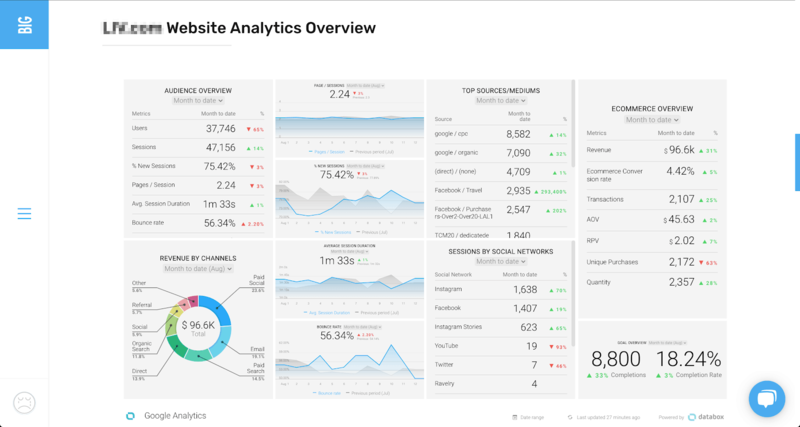 This level of transparency and real-time visibility into a client’s business is invaluable to us as we look to develop meaningful working relationships with our clients, and we only need to spend an hour or two building the dashboards in Databox when onboarding new clients. This means more of our time is spent on driving results, and less time is spent on managing the client. 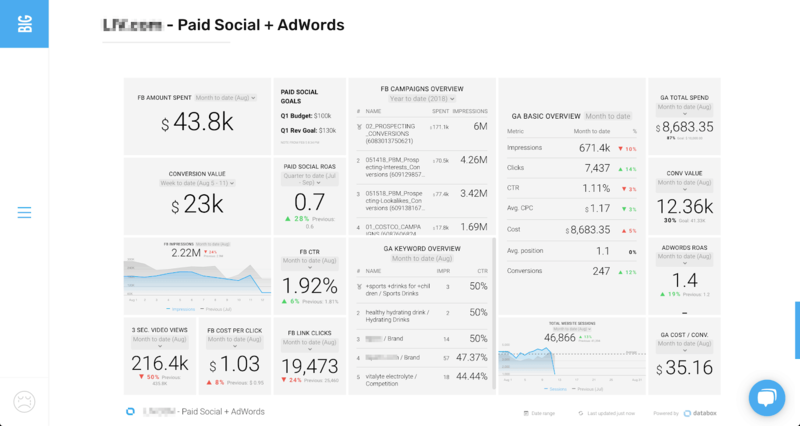 We had been conceptualizing these Client Dashboards for the past 18 months, but without Databox, the cost to implement and pain of managing them would have made it tough to prioritize as a project internally. Now that we have the structure built, and a good handle on how to use Databox for the delivery of so much key data in disparate systems … we have enjoyed the single unified view. We wanted to ease the discomfort that our clients can feel when working with an external partner, but in reality, everyone in our agency is now looking at the Client Dashboards as something that’s equally beneficial for ourselves and the clients. We’ve reduced the number of hours required to administratively and strategically manage a client by 50%, created a better way for our entire team to find the status of any client, and allowed our account managers to make strategy adjustments in real-time based on data and big picture goals with greater speed and accuracy every month. For Big Presence, all of this equates to an improved bottom line, better results for our clients and has even improved the culture within our agency as workflows improve and communication becomes easier. As the owner of Big Presence, I get full visibility into my business and can now find more opportunities to contribute to each client we work with. Here’s the full dashboard, if you want to see how all these pieces fit together. Charles Drengberg Charles is the CEO of Big Presence, a HubSpot Platinum Agency Partner in Newport Beach, California.